The J11HGA-30P includes a 30-gal. (113 L) air tank and features a belt driven “J” pump, which is a single-stage, four-cylinder pump with a high compression ratio for producing maximum air flow. 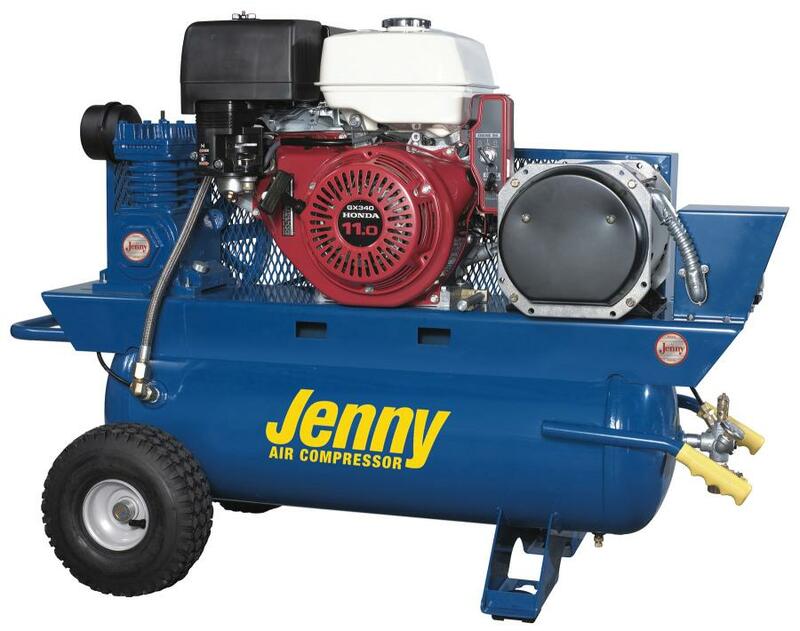 Jenny Products Inc. offers two compressor/generator combination models, providing portable air and a power source in one versatile machine for a variety of industrial, construction and do-it-yourself applications. The K11HGA-17P-3000W features Jenny's “K” pump, a heavy-duty, single-stage cast-iron compressor pump. The unit is powered by an 11-hp Honda GX series OHV engine with electric start and produces 8.9 cfm @ 100 PSI or 8.6 cfm @ 125 psi for quick recovery. Featuring a “G” pump and a 13-hp, electric start Honda GX engine, the G13HGA-17P-3000W delivers 16.2 cfm @ 100 psi or 15.6 cfm @ 125 psi. Each model includes a 3,000-watt, 115V/230V generator, providing a convenient solution for powering electric tools, lighting or other jobsite equipment, or as a backup power source during instances of power failure. The compressor/generator units are offered with 17-gal. (64.3 L), powder-coated, ASME certified air tanks. Maneuvering is simple with lifting handles integrated into opposite ends of the compressors' frames, and pneumatic tires are included to further enhance portability. Each compressor/generator model is equipped with numerous standard features for increased uptime and reduced maintenance. The compressors are belt driven with a large flywheel for easy start-ups and extra cooling, and a directional air shroud helps further reduce pump temperatures. Special unloading valves on the compressors also assist in engine starting. Additionally, the units come equipped with a totally enclosed heavy-duty belt guard, anti-vibration feet for smoother operation, a large canister intake filter with replaceable elements, manual tank drains, a stainless-steel braided discharge hose, pressure relief safety valve, regulator and outlet pressure safety gauges. Each unit is filled with Jenny “Ultimate Blue” synthetic compressor-pump oil for its splash lubricating system, ensuring complete oil coverage on the pistons, crankshaft, bearings, rings and cylinders. The compressor/generator combination units also come with an optional lubricator, airline filter and oil-sight glass. Other engine and pressure options are available upon request. For more information, call 814/445-3400 or visit www.jennyproductsinc.com.